So I decided to make some builds and post them of my HLSW replacement. This is still very beta. I have very little time to test anything and don't personally run any servers my self. It is built using Qt and requires Visual C++ Redistributable for Visual Studio 2015 for windows. So, what does it have and what does it lack. Im probably missing things that I cant remember right now. The code is on the slightly ugly side as this was my first real UI and first time really using Qt. The name is kinda... sucky too... oh well. To use simply extract the files in a folder and run. Added about button under settings. Added secondary method for getting external IP. Added more error messages for when logging fails. Added color to map and player count in server list. Fixed not removing rules and players when no server is selected. Added text box to chat tab. Moved get log button to the rcon tab. Added history to rcon and chat box (up and down arrow). Fixed outputs being appended incorrectly. Added a tool tip to server name which shows the IP. Added server IP to the info panel. Made logging pop up show only once. Added ping to server table. Fixed utf8 characters not printing correctly in rcon, log, and chat windows. Fixed a possible memory leak. Added SteamID's to player info when logging is enabled. Fixed incorrect connect time showing. Fixed commands being incorrectly encoded. Added the ability to copy player info table. Added the ability to stop auto scrolling for rcon, chat and log tabs by simply not being scrolled to the bottom. Scrolling back to the bottom will enable it again. Get Log and running rcon commands will now auth if not authed. Added the ability to copy the info and rules table. Added a show password checkbox for rcon password. 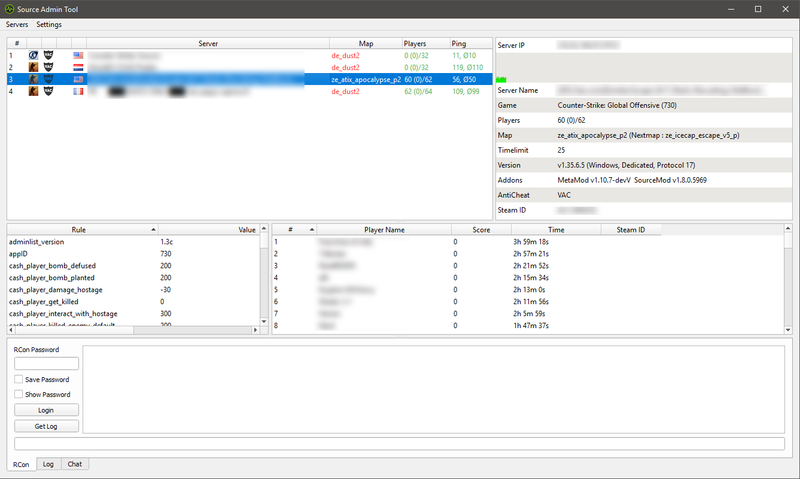 Added context menu to player table. Fixed a bug with queued commands running multiple times. Mac and Linux have been lightly tested. Last edited by Dr!fter; 03-12-2017 at 18:51. Great Do you have plans to add 'Chat' feature and right-click on player to perform common actions? The chat should show up in the log tab, although a bit cluttered. Ill probably add a chat tab and push all chat messages to that tab as well. As for the right click on players, I assume kick and ban are the options? I havent used HLSW in a very long time so cant remember what it had. Visit Happy DODs player's homepage! L 10/23/2016 - 11:11 6: rcon from "2.235.153.10:52973": command "log on"
L 10/23/2016 - 11:11 6: rcon from "2.235.153.10:52973": command "logaddress_add :52273"
Last edited by ElleVen; 10-23-2016 at 07:14. I assume when the info message shows up at the start it says listening on :52273 as well? I need to add another way to get the external IP. You can manually add the logaddress_add on the port and it should work. Last edited by Dr!fter; 10-23-2016 at 09:59. Updated. Full changelog on first post. 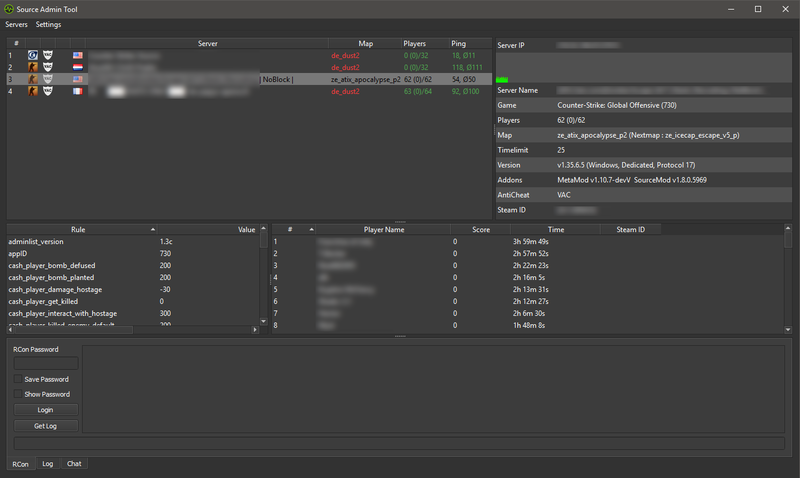 Mostly added another way to get the external ip used for logging and added the chat tab. Im open to suggestions on how to display chat. I currently went with something that I thought looked ok.
Im also opened to thoughts on the amount of scrollback being saved. Currently 100 lines of rcon, log and chat will be saved for each server currently logging. The active selected one will still keep everything in the box until another server is selected.